Another pizza by the slice joint... but with MUCH BETTER results! Located in the Bucktown neighborhood, I honestly wouldn't have even seen this restaurant if it wasn't for one of my friend's that lives nearby. Their restaurant is hidden in the corner of a 7-11 parking lot and shares a store front with Lil Guy's restaurant (a sandwich/salad stop). Anyway, you can tell My Pie is built more for the to-go and pizza by the slice options because of their limited seating options that essentially crowd their walking space. But, it doesn't matter about the ambiance, because I got my slices to-go and I was really impressed. They seem to have found a perfect balance with tomato chunkiness and cheese. They combined that with a great crust (similar to Pizzeria Uno's and Lou's), but somehow fall short when arranging it all together. 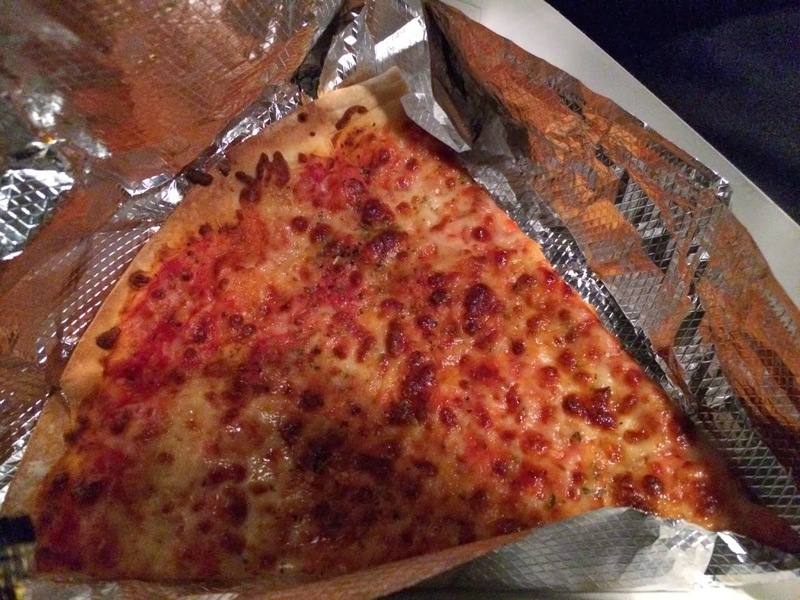 The thin crust also was confusing with a wonderful crust, but an oily profile. I wanted to like this pizza even more, but I think for now a 4-mile rating is all I could do. The recommended slice to me was the pepperoni deep dish. I happen to love deep dish pizza, so I was taking a gamble with this slice. Either I would love or hate it... thankfully it wasn't the latter. This deep dish slice has a nice buttery crust before being layered with cheese and a very chunky tomato sauce. Then a thin layer of pepperoni's are placed on top, allowing them to crisp up in the oven. The tomatoes must have been San Marzano because of the sweet and tangy sauce that resulted. Honestly, it was incredible... I happen to love chunkier tomato sauce and the thinner, yet thick buttery crust (similar to Lou Malnati's). My pepperonis were unfortunately on the burnt side because they reheat the pizza in the oven before serving, and for some reason they ran it through twice. The slice to price ratio is decent, but I have heard sometimes you get the shaft and are stuck with a smaller slice since their cuts aren't uniform. It is definitely worth the gamble, but maybe I will order a whole pie next time to eliminate that possibility. I was intrigued when I saw the thin crust slices in the warming oven. So I decided on ordering a couple slices. These slices were made with an extremely thin crust, bordering the level of a cracker. Then it was topped with a little tomato sauce and heavy helping of cheese. Obviously, the pepperoni had a thin layer of pepperoni on top, while the cheese was just seasoned with the typical italian herbs. I was very mixed on whether I liked or tolerated these slices. I found them to be on the greasier side, with grease actually dripping off the pizza after each bite. I think it may have been the warming process on the cheese, but regardless, I just couldn't figure it out. The crust was great though. I like how they actually make their crust thin and not just regular (and then call it thin). It had a perfect crisp to it and somehow held up to the ingredients and the oil. I know I will be back to My Pie, I guess I will make a game time decision on whether or not I'll order a thin crust slice. - When you order, go to the cashier side... I placed my order with the wrong cook and it was just a mess trying to figure out which pizza slices were mine. Not sure why it was a mess, but do yourself a favor and just follow the signs posted. - Parking lot available! It is small, but somehow whenever I drive by My Pie there are always spots available. - One of my friends suggests to only get pizza by the slice if they are fresh. I guess sometimes the pizza sits for a while and just isn't as tasty.